Here is some great news for all those out there with the Nokia E7 at their disposal, why not download ‘The Hangover Part Two’ trailer on to your device. The E7 uses Nokia’s ClearBlack Display technology, which gives you great image quality whether you are outdoors on the move or indoors just relaxing and a 4-inch AMOLED screen that is just ideal for watching movies on, such as The Hangover Part 2. Now in the first Hangover movie, we saw best friends Stu, Phil, Doug and Alan get up to all sorts in Las Vegas. However, this latest installment is set in Bangkok, where the guys reunite for Stu’s wedding. If the first film was anything to go by, then this one is going to be a great success when it is released later this year. Todd Phillips the Director is keeping tight-lipped on The Hangover Part 2 storyline at present, but what is know is that Zach Galifianakis, Ed Helms and Bradley Cooper all return for this movie. 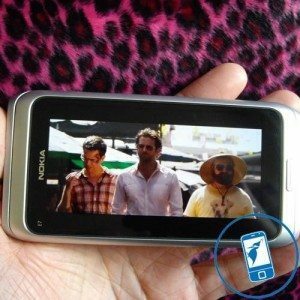 According to the guys a NokNok, when they downloaded The Hangover Part 2 onto their Nokia E7 the actual film content was a little light, but enough to get us excited when the film launches. However, they state that on the 4-inch screen the visuals are pretty amazing. So don’t delay, why not download The Hangover Part 2 trailer from Nokia Ovi Store onto your Nokia E7 today. For more information on the Nokia E7, you may be interested in reading a couple of previous articles we have done on the smartphone: Heading for 3 UK in April and Pre-order and Priced. I checked out the Hangover 2 trailer on my phone and the visuals and sound was incredible! Can't wait for May 26th when the movie finally comes out! I liked too much QWERTY keyboard of Nokia E7, I really loved typing word in keypad because I feel smooth and comfortable while I am busy on typing.